Android launchers are so numerous it’s easier to just stick to the one you once liked instead of venturing out to try a multitude of apps that do the same but look a little different. The pain with Android launchers is the majority of them just replicate what the stock launcher does; they just place things differently, add a couple of customization features beyond that stock functionality and voilà. 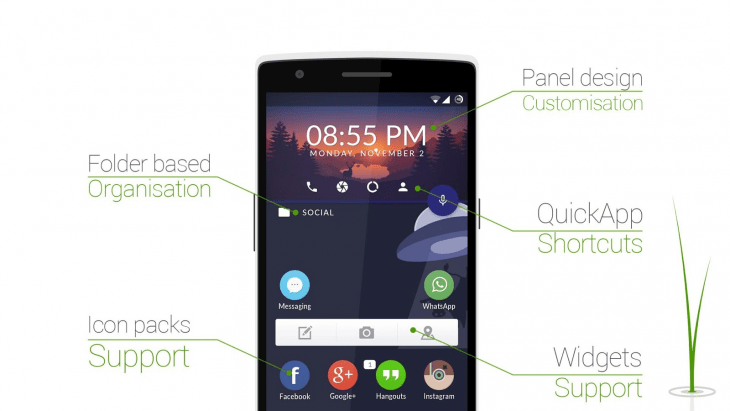 This is not to say some third-party launchers like Nova enjoy a well-deserved fame. However, the launchers landscape got stale at some point, where new, radical ideas were missing. HomeUX is that kind of a third-party launcher that does a few things radically different. 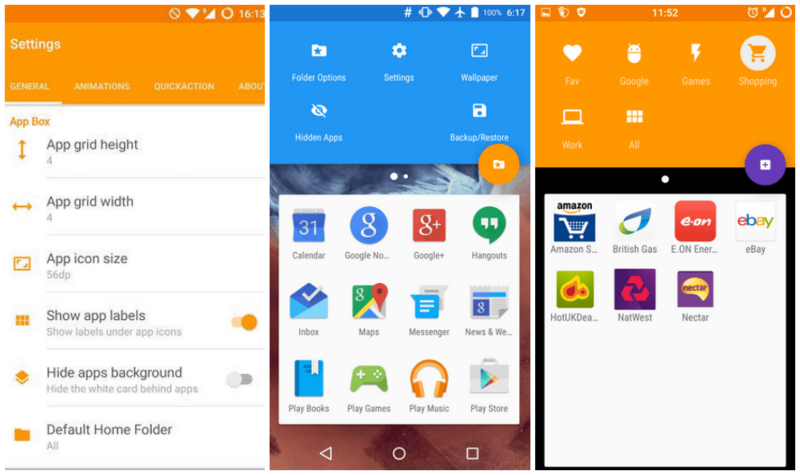 It aspires to give your home screen a clean, functional and different look by getting rid of the app drawer and replacing it with folders. Let’s get this sorted out step by step because, honestly, it took me well over an hour to wrap my head around how everything works here, but once I did, it clicked immediately. The learning curve is there not because it’s overly difficult or counter-intuitive. On the contrary, when you see how it organizes your home screen you will love it. It’s just that, different. 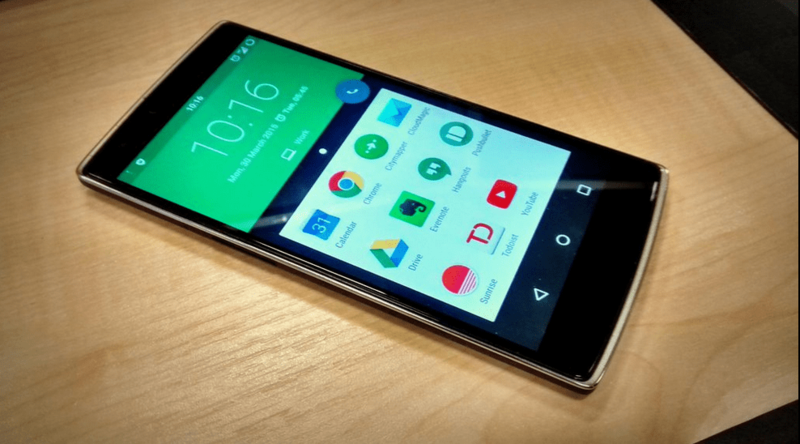 First things first, you need to run Android 5.0 and greater in order to try HomeUX. It comes in two versions – free and paid. The free version does not have ads, but has a few premium features locked. 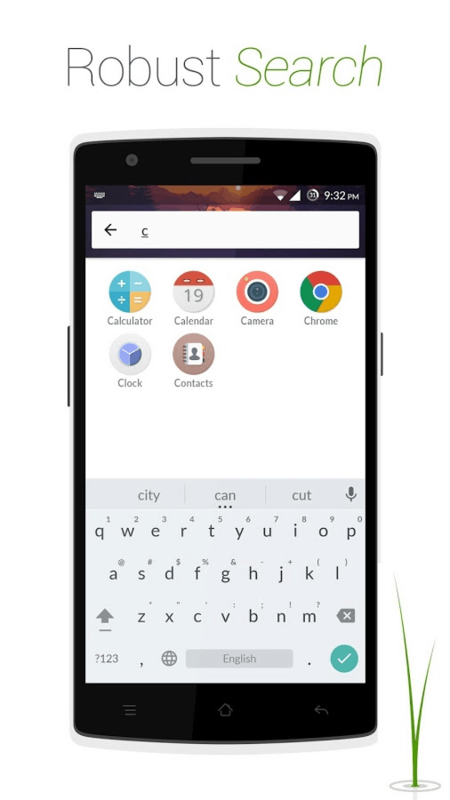 Namely, the feature that lets you customize the size of the icons and the font of the clock face, and the app icon badges. Now, the functionality. HomeUx divides your home screen in two areas – the upper zone is the action area; it displays a clock. You can customize its color transparency. Swipe left, and you will see an area where you can add and edit your folders. Swipe right to access the settings. Folders are those apps you see below the clock area. Tap + when you’re in the folders edit panel at the top area. You will be able to edit the folder’s name, the icon, the main color and the accent color. You can choose a background image for the folder instead of the main color. Hence, it’s up to you to compartmentalize your apps and games into the folders that would make it easy to find things. Since the app relies on gestures a lot, you just need to remember a few simple action gestures that work here. Long-tap on an existing folder icon and drag it to the small edit panel that appears below – that is how you can edit the existing folders, rearrange the apps that reside there. Long-tapping the folder will also allow you to move it among other folders to place it in a different priority sequence. Thus, the upper area is the clock. Swipe left to reveal the fodler’s icons. Tap any folder icon and the bottom area will display the apps in the folder. The bottom area is always a folder. You can set which folder gets to be the priority one. You don’t have to swipe in the upper area to get to the folders list. If you swipe up and down in the lower area, you will manually scroll through your folders. Notably, as you do so, you will see the color of the upper clock area change according to your current folder’s main color – this is a very neat design feature. It lets you see immediately that the folder has changed. You can choose for the apps to have a white background, which effectively covers your wallpaper, or to have it transparent. As I said, the upper clock area’s color intensity can be set to different levels of transparent so that it does not cover the upper end of your wallpaper. 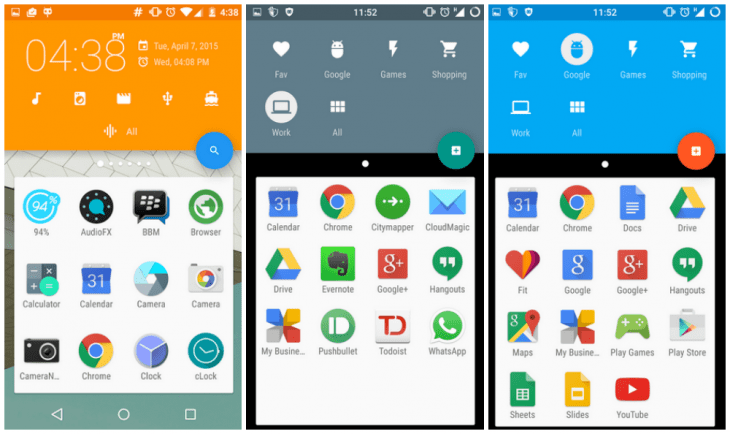 HomeUX supports third-party icon packs, and you can play to your heart’s content changing them. The premium version lets you adjust the icon size. And here comes my main gripe with the app – it does not support the landscape mode and does not do much good to the larger tablet home screen. On a tablet, the free version’s apps’ icons look miniscule, and it’s always in portrait mode. Additionally, the icons for the folders are so small it made my eyes hurt. Hopefully, the developers will add the tablet support eventually. The premium version also lets you have the notification badges on the apps’ icons, like in iOS. You can hide apps, and they will appear in your hidden apps folder instead of All. Now, let us see the settings. In the upper clock area, swipe right – you will see the options to change your wallpaper, choose a different icon pack, or access the HomeUX settings. Here you can adjust the grid size, icon size (premium), transparency, badges (premium), transitions, and the like. 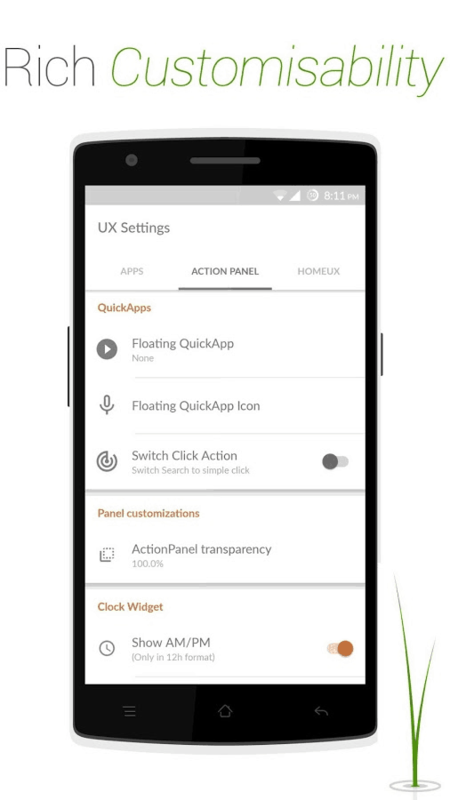 You can also assign a different app to the Quick App button – the one that resides in between the upper and lower areas of your home screen. Some prefer it to be a search option, I set it to Google Play. It’s in the Settings that you can set the default home screen folder, adjust the looks of your clock, and finally, reset the app’s settings, or on the contrary, back them up or restore. Long-tap on the lower part of the screen, where the apps in the folder are, to engage a pop-up screen that lets you add widgets, shortcuts or remove a page. Notably, the widget will be added to your current folder. Widgets can not reside in the upper part of the screen next to the clock. Therefore, if you are used to having your clock and weather together, I don’t think you can have it with HomeUX, at least for now. I also noticed the widgets can not be resized, which is a pity. At the same time, since you can have several pages in a folder, you can place all your widgets into a single folder and just not make it the first in line that appears whenever you unlock your phone. 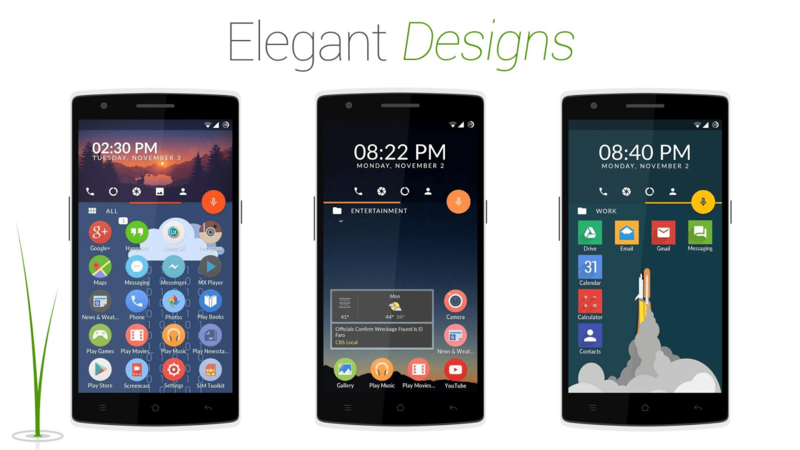 That way, you will have your home screen clean and elegant, and still have a quick access to the widgets. 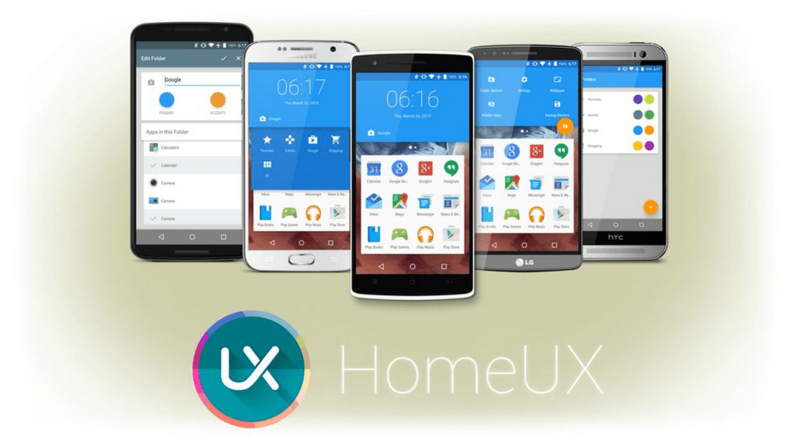 HomeUX is not critically far away from other launchers to be difficult to sort out. Once you get the hang of how to add folders, everything else is super easy. Just mind that the upper area is more or less static, designed to give you quick access to the app’s settings, wallpapers, and folders. Whereas the lower part always displays the contents of one of your folders. The design is neat and clean, in line with the Material design, but can be tweaked if you’re done with the bright colors. You can use custom images for the folders, so looks customization is nice. That said, the launcher does not scale right to the larger tablet screens (the folder icons are minuscule, the free apps icons are so small they look bad), so you might want to put it on your watch list until tablets are supported, if you are a tablet or phablet user. I will whine a little more about the folder icons – they are so many, and most of them seem outright useless, which makes creating and customizing a new folder a bit of a hassle. They are listed in a seemingly random order, which makes it difficult to find a suitable icon every time. The swipe gestures and long-tap actions are easy to memorize once you’ve used them once, so you won’t take long to get used to the new UI. Moreover, the way main color and accent color change the look of your home screen every time you scroll through your folders gives that touch of novelty you may miss in other launchers. Animations are also a visual advantage. Stability-wise, I have not experienced the bugs some users report on Google Play, but I’m a newcomer setting things up. This may change. Wrapping things up, I am glad I found HomeUX in the heaps of launchers on Google Play. Even though it’s still a Beta, and not without its faults, HomeUX can and does compete with Nova. It adheres to the Material Design, offers a sleek UI, beautiful animations, and an overall refreshing take on your home screen design and user experience. 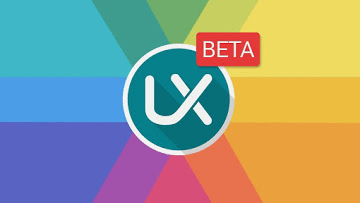 It offers enough of a change to at least want to try it, if your regular go-to launcher got boring. Its folders, as opposed to the traditional app drawer, make it easier to organize and find apps, while adding more diversity to your home screen. As of now, it supports Android 5.0+ only, and lacks support for the larger screens. Still, I am looking forward to seeing the prime time release of this launcher, with these issues addressed. I strongly recommend you give it a try.